From oil and gas industries to mining and wind energy, we provide induction heat treating that improves function, durability and safety. Alternative energy is the future, and at Zion Industries we’re proud to also provide heat treating services to help make that future possible. 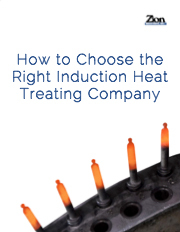 Why choose induction heating for Energy Sector heat treating applications? Induction heat treating provides fast and consistent heat in applications that require heat treating in a specific area of the part. Our process relies on electrical currents to produce heat within the component—heat that remains confined to precisely targeted areas, allowing for localized hardening or annealing. Our expert team is dedicated to providing our customers with consistency and quick turnarounds. We specialize in induction heat treating many standard and unique part configurations. Just send us your prints with specifications and target pricing, and we’ll be happy to provide a quote. If you have a difficult or unique application, Zion would be happy to do an engineering review and determine an induction heating solution that meets your needs. We look forward to working with you.